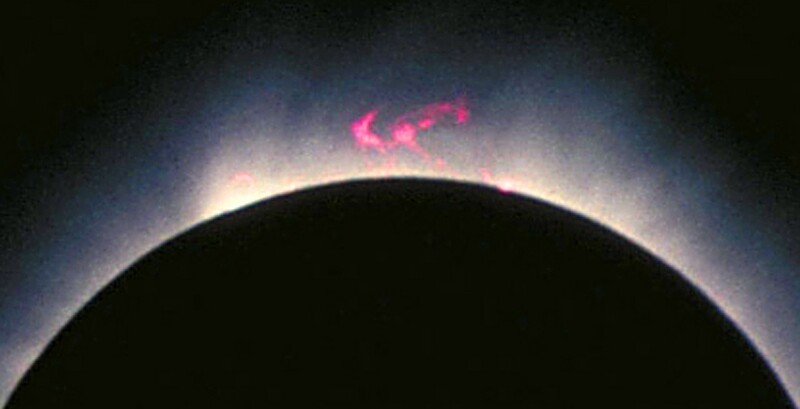 One of two solar prominences visible during the 1991 eclipse, about ten earth-diameters high. The overexposed photo shows the delicate structure of the sun’s hot white corona. 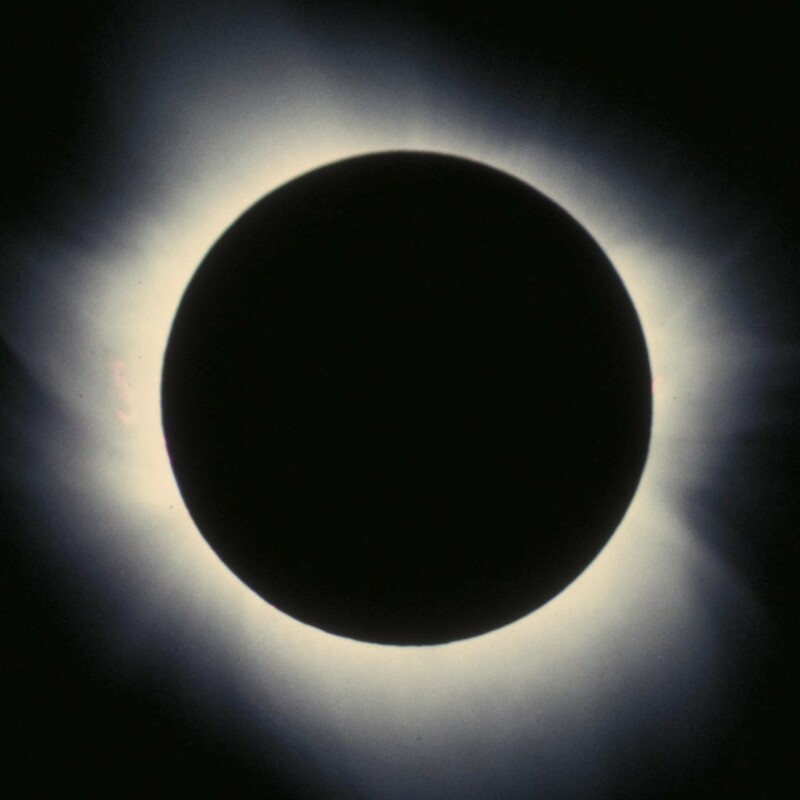 After writing and teaching about total solar eclipses for many years, I finally saw one on July 11, 1991, and was, as they say where I come from, gobstruck. The flight to our viewing spot, a remote beach in Baja California, Mexico, was an experience in itself. Four of us squeezed into a Cessna 172 at Palo Alto airport five days before the eclipse, and three days (and several adventures) later, we landed at Los Frailes, the closest airstrip to the eclipse centerline on Baja's eastern coast. By the morning of July 11, my four-inch refractor telescope was mounted in our "observatory" (a patch of sand protected from the wind by a tarpaulin) and right on time we saw "first contact," the moment when the moon's disk began its traverse across the face of the sun. An hour later, with two-thirds of the sun's disk covered, the temperature had dropped noticeably and the light was noticeably dimmer. Cacti took on a pastel color. We saw and heard birds, usually quiet at noon in that arid climate, singing in the pseudo-sunset. Shadows sharpened, so that I could discern the individual hairs on my head silhouetted on the sand. We saw hundreds of little crescents beneath a straw hat whose holes focused the sun, reminiscent of a pinhole camera. Then the mountains to the west suddenly darkened as the moon's shadow, racing at 1,300 mph across our planet, cut sunlight off from the peaks. Seconds later, as if someone had turned a switch, we were in totality. The abruptness of the transition -- a sliver of sun to no sun -- came as a shock. Overhead, the white wreath of the corona was huge, extending two or three sun diameters from what appeared to be a round hole in the sky. With the naked eye, we could make out two prominences of hot gas, while through the telescope, they were spectacular: ruby-red fiery arches extending at least ten Earth-diameters from the solar "surface." The minutes whizzed by until (far too soon) the sun returned. I was looking through my telescope when first a single bead of sunlight, then an incandescent avalanche of photons blasted my retina. It was past time to replace the Mylar solar screen. We'd read previously that people generally cheered when the sun returned. Not our little party. We looked at each other with the expressions of those who had seen a miracle, and weren't ready for it to end. Our wake was lubricated with Cerveza Pacifico in a nearby cantina. Barry Evans' (barryevans9@yahoo.com) life is divided into divided into BE and AE (Before Eclipse and After Eclipse).